Summaries of Decisions from Trustee Meetings. As you will have seen in October's magazine, the organisers of the Parents & Toddlers group have decided to call it a day after many years serving Slinfold's families. If anybody wishes to start up a similar group there would be assistance from Rural Horsham Children and Family Centre and intial financial support from the Village Hall. If anyone is interested please contact Neil Peachey or Sally Chrusciel (01403 785316) / office.ruralhorsham@westsussex.gov.uk). 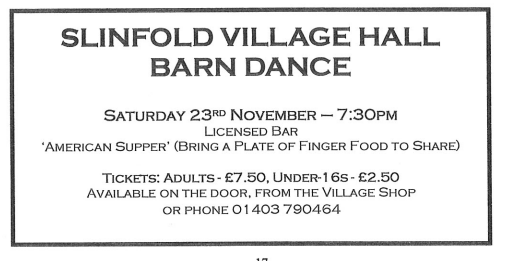 We are holding a Barn Dance on Saturday 23rd November. The event will start at 7:30. Everyone is welcome; there is a special low entry price for under-16s, and it doesn't matter if you don't know the steps as all dances will be fully explained and called. There will be a licensed bar, and food will be in the form of an 'American Supper' -which is where everyone brings a plate of finger food to share. Finally, future events at the Village Hall will only be possible with people willing to help organise and run them. Please contact Neil Peachey if you feel you can help - in however large or small a capacity. For those who come across this blog unknowingly, Slinfold is a village near the town of Horsham, in the county of West Sussex, England. This blog is aimed primarily at those involved in the running of the Village Hall in Slinfold, those who use it, and other local residents who have an interest in the Hall. The main website for Slinfold Village Hall is available from the links below. Copyright Slinfold Village Hall 2011. Powered by Blogger.